Imagine 145 young men from the inner city who love to sing classical music; they faithfully do their homework; and all of them plan to go to college. It sounds too good to be true? Well, you haven't met "American Hero" Earle Lee. The young men of Tallahassee, Fla. have a lot to sing about, as The Early Show Contributor Debbye Turner found out. They're getting a chance at a brighter future and Lee is the man they have to thank for. He has helped trouble boys in Florida tune out the streets and get turned on by the stage for seven years. "I saw where children needed a way to express themselves," says Lee. "Kids that had been abandoned, kids that had been neglected, could use their talents and use music as a therapeutic tool." 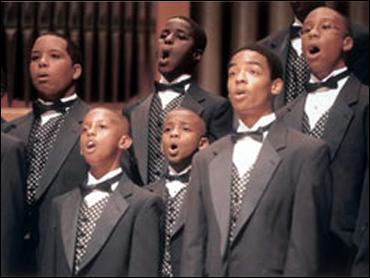 Armed with a degree in social work and music, Lee formed The Boys' Choir of Tallahassee in 1995. "Eighty-five percent of the boys live without fathers in the homes," explains Lee. "So, there's a lot of pain there and that's why we have this Boys Choir of Tallahassee, for them to come to and make music and receive support and love and guidance and lots of discipline." Any boy between eight and eighteen can join. No questions asked. "When they hear today is the first day of the rest of your life, you see a smile on their face and they want to achieve after that," says Lee. But before they can sing, they have to study. Lee wants all the young men to go to college. His kids say he gives tough love. "I see Mr. Lee as someone that I can talk to about stuff," says Timothy, a choir member. "Well, I didn't really have a father inside my life so when I come here he's like a father to me," explains Fontraish, another choir member. Lee says he participates in the boys' lives because he cares. He explains that the children will be able to sense any false sincerity. "We have to be there for those children, it's either be there and form a choir or help build another jail," says Lee. "I'd prefer forming another choir." Does he speculate where some of these boys would be were it not for the choir? "I don't speculate. They tell me," says Lee. In 1999, Anthony Reddings was arrested for selling drugs. The judge gave him a choice, either serve time behind bars or time in the choir. Reddings chose the choir. "I love this choir, I look forward everyday to coming here," says Reddings. "I'm the total opposite of what I used to be. I wasn't into academics as I am now, I wasn't people friendly." Judge Charles Miner, Florida, District Court of Appeal, has been a fan of the choir since the its beginning. He has seen how Lee turned even the toughest kids like Anthony around. "Earle has done remarkable things with these youngsters," says Judge Miner. "He's made everybody in Tallahassee mighty proud, not only of him, but of each one of these little fellas." The choir has won countless awards for their performances around the world. But Lee's greatest reward is seeing the choir's alumni go to college — every single one. Lee wears the hats of choir director, mentor, friend and father proudly. On days when he says he doesn't have much left to give, it's the boys that keep him going. "Those boys, the kids, a boy that has lost his mother, we have a kid in the choir whose father died of aids … yet they still make the honor roll and they're not getting in trouble and they're not on drugs and they're not in gangs," says Lee. And so if you're looking for a hero, you don't have to look on television, hero's are right around you." House Oversight Committee Chairman Rep. Elijah Cummings and Sen. Mike Lee to appear on "Face the Nation" this Sunday.